Some of the most addictive pleasures in life abound in the Dordogne region of France. These include miles of verdant farmland and forest, fortified medieval villages, prehistoric caves with Neanderthal paintings, and regal châteaux that seem to make a mockery of modern billionaire dwellings. Mix all of this in with roadside stands offering foie gras where you'd expect to find sweet corn. Although the Parisians and Brits are sweeping up properties in Southwest France, the heart of Dordogne, west of Bordeaux, is relatively tourist-free, partially because it's not easy to reach. Days can go by before you see a single tour bus lumbering towards the next photo opportunity. One of the reasons is that it's not easy to reach. The best way to get there is to take the luxurious TGV from Paris for the three-hour ride to Angoulême, where all the major car rental companies have offices. If you don't drive a stick shift, reserve an automatic car at least one full month in advance. You could spend your whole life exploring the Dordogne and not see the same thing twice. Ergo, for a 72-hour experience, it's best to concentrate on the Dronne Valley. From the River Dronne, the valley's lifeline, you can drink in the best of the region. The river passes gently through farmland with cows, meadows full of sunflowers facing in one direction as if commanded by some unseen drill sergeant, and leafy forests where you can sit under a shady tree and not feel guilty about reading a book. If you could capture the spirit of the Dordogne in a single word, it would be serenity. Head for Brantôme, which is about an hour and-a-half drive from the car rental offices in Angoulême. Brantôme sits on both sides of the Dronne, which is why every guidebook calls it "the Venice of the Dordogne." Certainly there are picturesque bridges crossing the river, but Brantôme still wouldn't be considered Venice unless it were designed by the Swiss. The streets are clean, there's plenty of parking, and you won't find tour groups descending on every ice cream stand. Consider this your splurge day and check into Le Moulin de L'Abbaye, situated just as you enter Brantôme. This eight-color postcard of a property is part of the Relais et Châteaux group, which means you'll get the best of the best of Dordogne. 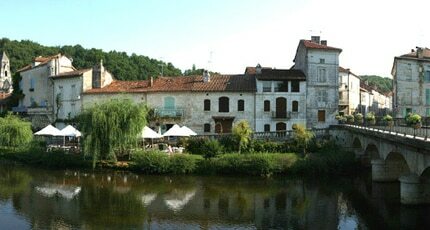 Le Moulin is made up of three romantic buildings steeped in history and overlooking the river. This was the home of Abbé de Brantôme, author of the scandalous "La Vie des Dames Galantes." Le Moulin de L'Abbaye rivals any palazzo in Venice for romance and cuisine. Brantôme is virtually an island in the River Dronne and the most dominant building is the Benedictine Abbey. There has been an abbey on this site since 769 and, although it still functions as a church, the main building has been given over to the Hôtel de Ville and art galleries. Another structure is a former monk's dormitory, which has an amazing wooden ceiling and a large display of prehistoric artifacts. Hopefully, it's Friday and market day. Everybody from fishmongers to mattress salesmen elbow each other for space, and Brantôme turns into one huge gourmet flea market. Cheese merchants offer various cheeses wrapped in diaphanous paper; these fromages are made daily by farm women. The rôtisserie master offers hot roasted chickens soaked in onion gravy that shame those you'll find in most restaurants. Fishmongers abound with local, live salmon trout swimming in tanks set on the back of trucks or station wagons. Do not forget to take home a bottle of the ambrosia-like walnut oil, which is milled locally and is a Brantôme specialty. After a leisurely picnic accompanied by the delicious local Bergerac rosé, drive along the River Dronne to Bourdeilles to visit the Château le Bourdeilles. These castles, situated on a romantic curve of the river, are 10 kilometers from Brantôme and should not be missed. The complex consists of two structures: one from the 13th century and the second from the Renaissance. The castle has wonderful views of the entire area, so don't forget your camera. The omnipresent Pierre de Brantôme was born there in 1540 and rose so rapidly in the church that Mary, Queen of Scots chose him to accompany her on the ill-fated journey to Scotland in 1561.